MOT fails, crashed, bashed, unfinished projects, basket cases or just not loved anymore (motorbikes only). Fair prices paid. Cash waiting. HONDA: XL125V, CBX550F & F2 (4), VF750 Sabre, VF750F, CB750KA, CB750 / 900F & F2. SUZUKI: GS550, GS500E, GSX400F, RF400F, RF600F, GSXR750m GSXR1100. YAMAHA: XJ600 Pre Div, XJ600 Div, FZ600R, FZ750 Genenis, YZF6R. PLUS, we have some other spares that may have come with job lots of parts we have purchased. After looking for parts for my classic Yamaha, and not having much success I decided to look into selling parts myself. We source good second hand parts and all parts are checked and cleaned. I have been riding motorbikes for the last 30 years or so, and still had a few parts about the house. My first bike was a KH250 Kawasaki, them it became a KH250 with a race tuned KH400 engine. After that I had Suzuki GT380, 500, 550 and 750, GS850, GSX1100F and GSX750EF. Yamaha XJ600, XJ650, XJ750 Seca and FZX750. 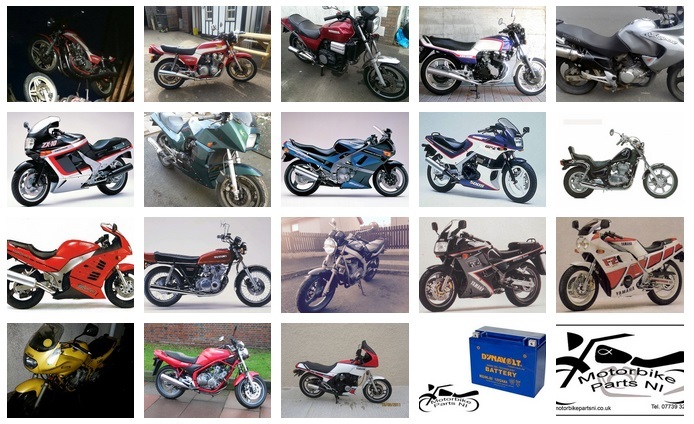 Honda VF500, CBX550F2, CBR600F, 6 CB750's, 2 CB900F, CB900F2B, GL1000 and a Kawasaki GPZ600, just to name the ones I remember. The latest addition to the Boyd stables is a Honda CBX750FE that has had brakes done, new chain and sprockets etc but needs a front tyre and a tidy for MOT. I have gathered a wee bit of knowledge over the years and really enjoy working at the older classic motorbikes.